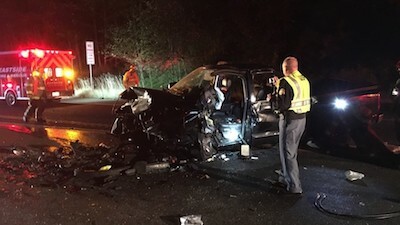 Two people were killed Friday morning in a two-vehicle head-on collision along State Route 18 near the Tiger Mountain Summit in Issaquah, according to the Washington State Patrol. State Patrol says a pickup truck heading west crossed into oncoming traffic and struck another car. Two people in the car were killed. The pickup truck driver was taken to Harborview Medical Center in Seattle in serious condition. Investigators think the driver of the pickup truck was impaired, but have not said whether it was drugs and/or alcohol. State Patrol says the driver will be investigated for two counts of vehicular homicide. SR 18 is blocked between Issaquah-Hobart Road and Interstate 90 and will stay closed for several hours for the investigation into the cause of the multi-car accident. Further information about the crash is not yet available. The incident remains under investigation. Wrongful death is defined as the death of an individual caused by recklessness or negligence of another person or entity. Immediate family members file a wrongful death lawsuit or claim to get compensation for their emotional and financial damages. Negligence: Family members must prove the death was caused by the recklessness, carelessness, or negligent actions of the defendant. Breach of duty: The family must prove that the defendant owed a duty to the deceased victim. A common example of this is that motorists maintain a duty to drive safely and obey the traffic laws. It is up to the family and their attorneys to establish how the duty was breached. Causation: On top of proving how the duty of the defendant was breached, the family must prove how the defendant’s negligence caused the death. Damages: The family must prove quantifiable damages related to the death of their loved one. That may include medical expenses, funeral costs, loss of future income and financial support, loss of guidance, etc. "There are a number of different variables and factors that can ultimately affect or determine the value of a wrongful death case. It is important for someone pursuing a wrongful death claim to understand what these factors may be and why they can have an impact on civil claims. "Ultimately, we came up with a list of the eight biggest factors that can affect wrongful death settlements and awards, but there are likely even more factors depending on the exact type of case and the details involved. If you or a loved one is currently dealing with the wrongful death of a family member, it may be in your best interests to read through and share these potential issues with them as you pursue a claim." If you suffered the death of an immediate family member due to the negligence of another, Washington state law allows you to seek compensation for damages after an auto accident — including the loss of financial support and loss of benefits — through a wrongful death claim. The attorneys at Davis Law Group understand that no amount of money is adequate when a loved one has lost his or her life, but we also realize that a wrongful death claim can ease some of the financial problems you’re facing as you try to move forward. Please call (206) 727-4000 for a free case evaluation with one of our experienced wrongful death lawyers if someone else’s carelessness contributed to the death of a family member.